The Pedion Urban Battlefields Kickstarter has been the breeding ground of a great many Urban Terrain innovations so far! 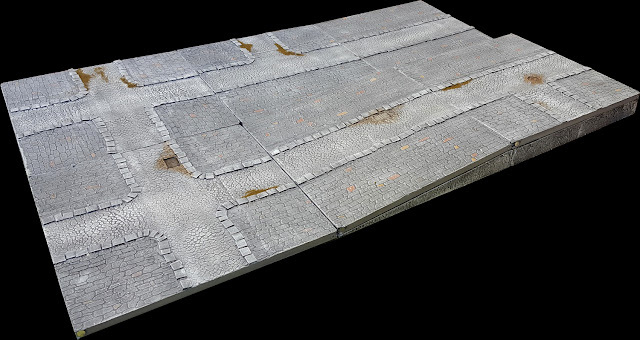 One of the most recent and original is the ability to have an urban landscape with multiple elevations - and without needing any new tiles for your terrain board! This is a personal favourite of mine; having grown-up in cities with uneven roads, full of hills and sloped streets, I always considered a "flat" urban environment a bit unnatural. I know this is far from the truth, but there are still many cities out there, especially older ones, that are built on hillsides and spread out on different levels. This System is Pedion's way of trying and emulate these differences in elevations. You can now create uphill/downhill streets, or different height levels for your city blocks. It certainly is not omnipotent, and we still have to cope with the realities of wargaming. But it truly enhances the cityscape, going above and beyond what a simple cloth mat board could do. Urban "Medieval" themed tiles in 3D! The elevation system utilises three (3) special addons to work. The main idea is that you will NOT need extra tiles to emulate slopes and rises; you can use your urban tiles from your Set rewards, and arrange the addons differently each time. The first addon is the Urban Slope Support. It is a ramp, designed to be placed underneath your tiles and tilt them. One tile edge is raised by 3cm, to a total height of 4cm. 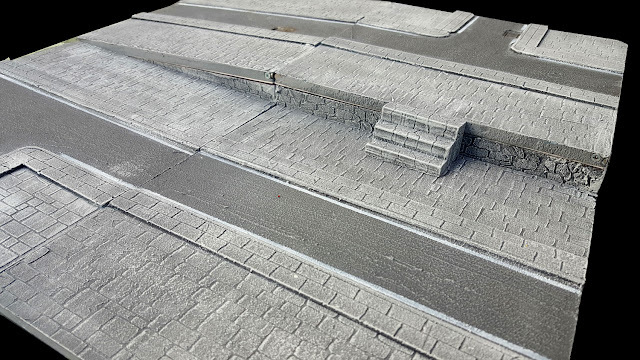 This creates a 10% slope, which can be used to emulate uphill streets and it is gentle enough so that miniatures and other terrain will not slide off. The addon's sides display a stone texture, to show that they are artificial structures. The sloped tiles will hold your models and vehicles with ease. They will also hold extra scenics like trees, fences, and even buildings will not slide off. However houses may look a bit tilted, although this can be amended with a reverse wedge underneath them. The second addon you need are the Urban Rise Supports. These are also designed to go underneath your urban tiles, and raise them uniformly by 3cm, to a total height of 4cm. Thus they emulate different levels in the same city. Their sides have the same stone texture, to give the impression of built up, artificial structures supporting the building over them. The height of 3cm keeps them slim enough to store easily away. The final addition are a set of stairs! When using the Urban Rise Support to raise your whole tiles by 3cm and create different levels, then it is imperative (at least for gaming reasons) to create access points to and from this higher rise. The main transit method to the higher level are sloped, uphill roads which you can form with the Urban Slope support - this is actually the only way for vehicles to climb up to the Rise. However, as it is common in many cities, rises are also connect by stairs. 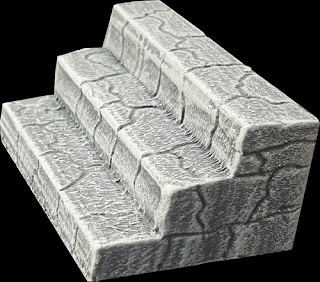 The addon is a small Stone Stairs, made from resin and handpainted, and it is intended to be used in combination with the Urban Rise Supports in all three Themes. Its height is 3cm, exactly like the height difference between a standard tile and a raised one. The stairs are 7cm wide (so they can be even placed at "end" of a cobblestone road) and each step is 1cm high and 1.5cm deep. What's Next with Stretch Goals? Pedion Urban Battlefields Kickstarter Launched!